In this coming-of-age tale that blends myth, mystery, and the magic of storytelling, we enter the world of a fifteen-year-old seeker named Eve. Growing up in rural Poland, Eve’s small-town existence is radically transformed by a series of lucid dreams, influenced by the moon, in which she is exposed to Sariel, a fallen angel. Sariel’s cryptic messages, and demands for Eve to free him, draw her deeper and deeper into an ancient story of love, loss, and redemption. Eve’s desire to heed the callings of her inner-life are confronted and challenged by family secrets and growing dysfunction, and her increasing alienation from her peers at school. Determined to find out who she really is, and the truth about her family legacy, Eve undertakes a quest, guided by a strange boy who calls himself Punk, in which dreams and reality merge, and a buried past is brought into the light. Ewa K. Zwonarz is a Polish-American writer and an avid researcher of myths, mysteries, and unified sciences, with the aim to uncover the truth behind human origins. Ewa is a recipient of several awards in journalism and film production, a published poet, and a blog author. She graduated valedictorian with a bachelor’s degree in mass communications and works as a strategic analyst for a Silicon Valley startup. When she is not working, Ewa is traveling the world, collecting morsels of inspiration for her future projects. Moonchild is her first novel. I was kind of surprised by how much I enjoyed this book and how quickly I read it. There were a lot of aspects I liked and disliked about this book. I loved the storyline, the plot, the fact that it had magic and angels in it. I'm a sucker for a book with angels. Eve is a teenager trying to figure out who she is. A series of lucid dreams sends her on a path of figuring out her own beliefs. She has to dive into her families deep secrets to uncover the meaning of her dreams and the angel that she has fallen for. I really enjoyed getting to know the characters though some confused me. I liked Eve and I understood she was just questioning life, who hasn't questioned everything around them from time to time? Punk was a unique character that I grew to like and so was Daniel. Ben however I did not care for and what happened to him? He just disappeared and never came back, along with Rock. And I really liked Rock. (Yes there were some interesting names in here.). It was quite annoying how Eve never really thought about anything before she did it. Until she met Daniel and then her whole life changed. She completely changed everything about herself for him which I always find annoying. Even though he was not a love interest she still gave up her life to save him. She had no friends by the end of this book other than Punk. After meeting Daniel was when she found purpose for herself though and you could see her getting stronger and changing. There were times I felt really confused and lost throughout the story, mostly at the beginning. I felt like I missed something and got to the point I went back to see if I did. There wasn't enough descriptions in certain times when a more laid out description would have been nice. I normally hate books that are too descriptive but this one just didn't have enough for me. But the way Eve's thoughts were explained was amazing. I loved the mythology about angels in this. It was different which made me like it more. 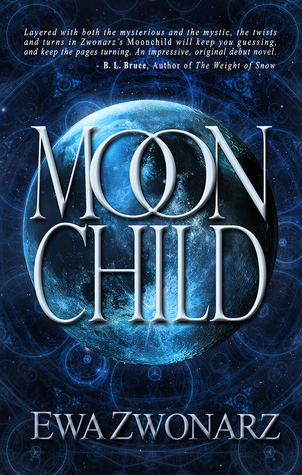 Overall I'm really glad I read Moonchild.